Rethymno (population 30, 000) is the ‘third city of Crete’, lying 75km west of Iraklio and 50km east of Chania. 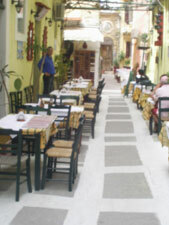 Rethymno is one of the most interesting cities on the island for visitors. The national road from Iraklio to Chania passes nearby. The 11km long beach of Rethymno is one of the nicest of the island. Sadly, there are too many hotels, bars, shops and apartments which have been built here in the past few years. Rethymno does not have an airport. The nearest can be found in Iraklio and Chania. You can get from Chania to Rethymno in one hour by bus. If you come from Iraklio, the bus takes approximately one and a half hours – departures hourly. 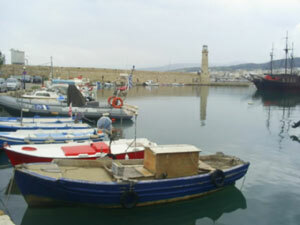 Rethymno gets less ferries, too. At the moment (early 2019), there are no ferries to Athens, but 1 or 2 fast ferries to Santorini during the saison. The new ferry port is adjacent to the old port, which is in the town centre. My favourite pension is Olga’s Pension in the old town. For around €35 in the summer and as little as €25 in winter, you can get a nice double room from the plant-loving owner, Giorgos. The touristy restaurants in the old town should generally be avoided, since they provide poor food at inflated prices. If you go out of town slightly, you will find a campus of the University of Crete. In their canteen, you can eat and the food is tasty. The University also has a big library with many English language books and internet access. In town there are a few buses, but nothing is too far away. Bus number 10 goes to the University (about 3 kilometers). You have to buy tickets (about 1,30 Euro in 2019) at kiosks or in the bus station first. 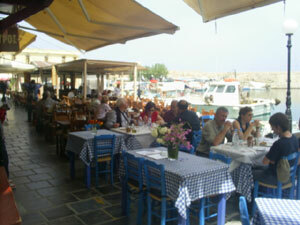 The Venetian Port: Many restaurants and bars (mostly expensive rip-offs) are around the most picturesque port of Crete. 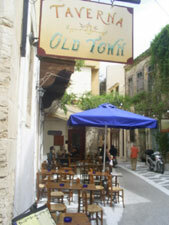 Old Town: The protected Old Towm of Rethymno is the nicest on Crete. 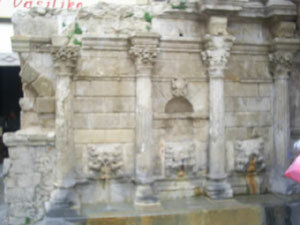 The Centre is the the Rimonti Fountain with its three lion heads. 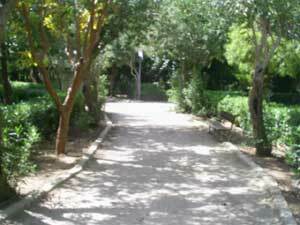 City Park: A nice park in the town centre which provides a quiet, leafy respite from the hustle and bustle of the town. Moni Arkadi: A monastery about 20km from Rethymno. This fort-like monestary is the most famous on Crete. 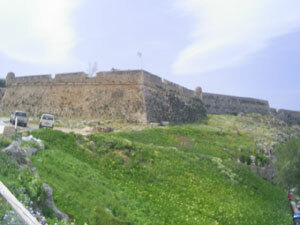 It was a centre of resistance against the Turks and nowadays many Cretans view it as a symbol of their hard-won independence. There are three buses daily to Moni Arkadi from Rethymno in the summer. Armeni: a village 10km to the south of Rethymno. Whilst the village is nothing special, there is an ancient Minoan cemetery Armeni nearby. You should see it when you pass through (no entrance, Monday closed). To get to Armeni, take the buses to Plakias or Agia Galini from Rethymno. Perama: a small village with little tourism. Close by is the cave of Melodoni (the home of the giant Talus in Greek mythology) and Margarites. The village is famed for its local pottery, which you can buy remarkably cheaply in many shops there.